← Which Goddess Has Strong Moon Connections? Learning to read Tarot cards can often seem quite difficult, especially when one is learning how to read Tarot cards one one’s own. However, if one follows some simple methods, the process of learning how to read Tarot cards can be a really interesting journey. The things you need before you begin to learn are a deck of Tarot cards and a notebook and a pen/pencil. 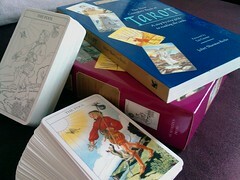 Another thing one should consider investing in is a book of Tarot card meanings. The confusion arises at both these junctures. A beginner student always has these questions: “Which deck to buy?” and “Which book to buy?” Let me help you with those decisions first. Ideally buy a deck whose imagery resonates with your belief system and your knowledge base. There are several thousands of Tarot decks available in the market today that are based on a number of different themes. Go for a deck which you will find easy to understand. See the images of the cards before you buy. If the deck’s images don’t stir anything within you, keep looking for more. For example, don’t buy a deck based on Celtic Mythology if you don’t know what Celtic myth is all about. Because you will then have to spend time learning about the basics and then be able to pick up the deck and study it. The next thing is the book. Buy a book which covers the basics – there should be meanings of the cards explained in a simple and straightforward manner. Often, themed decks come with their own books. But if you are interested in the finer aspects of the cards (like mythology or symbolism) then you need to look for specialized books on the subject. Search for something that suits you. Take the card in your hand and see the images. Don’t read the book just yet. Just see the images and write down what comes to you when you see the picture. What you write down can be as descriptive or as short-and-sweet as you like. Once you have done this, open the book and go through what the book says about each card and compare that text with what you have written down. Mark the common passages / ideas by underlining or highlighting them. Think about the meaning of each card – and write down the name of a song which reminds you of this meaning. This will help you really get into the mood of the card and understand the meaning of the card effectively. A card will often have several meanings. So which one is right for you? Choose any 3 interpretations from the ones which are common between your own interpretations and what is given in the book, and shorten them into one word or one short phrase. This makes it easier to recall the meanings when you are doing a reading. Once you have gained a mastery over the meanings of the Tarot cards, doing a reading can often become a comparatively simple procedure. John Defoe — If you want to learn to read Tarot cards, go ahead and visit and download your copy of the e-Book today!